Rainwater cisterns can be distinguished by being larger and either above or inground.I wil only be explaining what they are,what you can use it for, and some general guidelines on them. 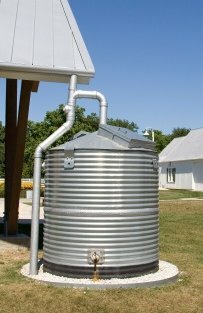 Rainwater cisterns are like a rainbarrel, collecting rainwater that runs off roof tops, either from your home or barn roof. Instead of being stored in your typical waterbarrel of 50-80 gallons,rainwater cisterns are stored either above or below-ground usually in a concrete or masonry tank for later use. They are ideal for farms and homesteads situated on waterless land. Rainwater cisterns installed above ground avoid the cost associated with excavation and certain maintenance issues, on the other hand cisterns that are below ground benefit from cooler ground temperatures in the summer and warmer ground temperatures in the winter. Are Cisterns right for me? First, You must live in an area that gets plenty of rain. As a general rule, if crops can be grown without irrigation where you are, there'll probably be enough precipitation to meet your water needs. If you find yourself without rain for a long time, you can always have water hauled in at a cost of approximately 10$/1,000 gallons. 2nd, Another important point is that the surface where you are collecting rainwater should not be a polluted area, like example a major highway, fields or orchards where spraying occurs, or factory smokestacks. 3rd, your water needs shouldn't be excessive. If you think about the water consumption of the average American or Canadian which spends 100 gallons of water per day, per person, then yes you will need a tank that can hold water within a range of 5000 to 10,000 gallon capacity or larger. 3.) Fitted with some type of overflow opening. For optimal protection against contamination, the water-cistern hatch door should fit tightly, the overflow should be screened to prevent small animals from entering, and care should be taken to locate outhouses, septic tanks, cattle run-off areas, etc., at least 100 feet away (preferably downhill ) from the tank. The cistern should absolutely have a hatch door on its top, since the vessel's floor will need to be cleaned every couple of years or so.